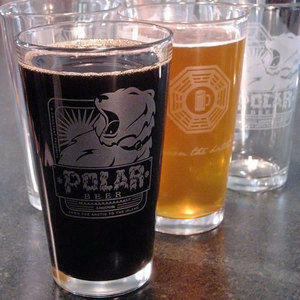 This Asheville, NC-based graphic designer creates LOST-themed drinking/living paraphernalia, including the scratchboard-sketched, blue "Polar Beer" tee (a label w/ a roaring bear, "Down the hatch! ", "MAAAAAAAAAAAALT LIQUOR") and matching pint glasses. You can also print free PDFs of "Dharma Initiative" beer labels or a 70-item LOST bingo set featuring squares like "Claire mentions 'My baybee'", "Someone demands answers", and "Locke has a knife", a square you'll never get to mark when you're playing with Paul Hogan.